The vicious cycle that has plagued Thailand’s fishing industry and fuelled human trafficking. Since 2014, EJF’s investigations have exposed human trafficking, forced labour and illegal fishing in Thailand’s fisheries. We have since seen significant improvements in the way Thailand is tackling these problems, but more remains to be done. Alongside exposing the horrific treatment of migrant crew on Thai fishing vessels and demonstrating how this problem is closely linked to illegal fishing, EJF continues to work with the Thai government, from high-level decision-makers to on-the-ground port inspectors, to push for the effective enforcement of new laws protecting workers at sea. 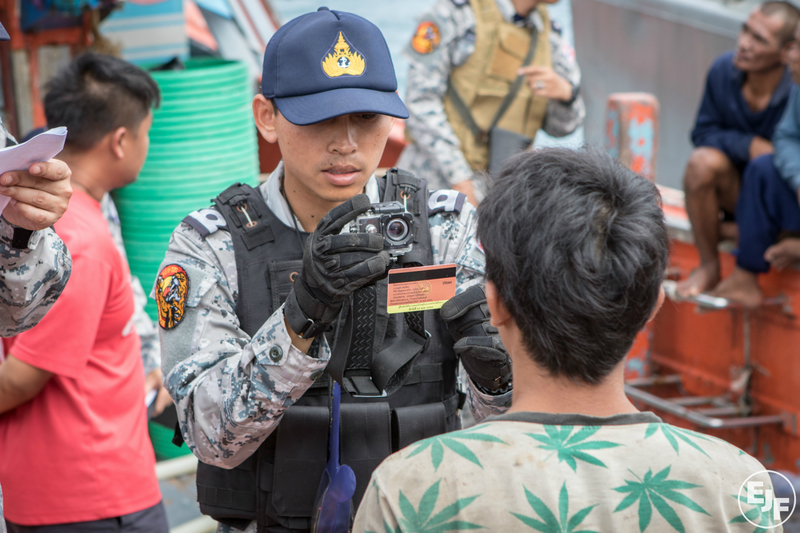 Thailand’s efforts have included new fines for illegal fishing, installation of tracking devices on all commercial fishing vessels, introduction of new portside inspection measures across the country, and ensuring all migrant workers are registered and screened for potential signs of abuse. EJF is working to ensure that these are effective. Many technical measures, such as at sea-inspections, are vital to ensuring boat captains follow new laws. But in practice, gaining the trust and confidence of the workers, especially those who have been abused, can be difficult. Our staff carry out frequent field visits across Thailand to observe labour inspections in ports and at sea to observe how reforms are being implemented. Where gaps are identified or it is clear migrant workers remain distrustful of those responsible for protecting them, we work with the Thai government to train officials to carry out inspections that build confidence and can identify indicators of human rights abuses. At the core of Thailand’s fisheries, there are two key factors fuelling the current crisis: the relationship between massive levels of overfishing and illegal fishing and an insidious exploitation of predominantly migrant workers. We have seen first-hand how as catches have diminished, boat owners have sought to fish further and longer from land. They deploy their nets for longer, and use nets with ever-smaller holes in order to maintain their profits. Some nets (now banned by the authorities) were so tightly woven that they were more akin to mosquito nets, meaning that they were sweeping up even the smallest fish. Increased fishing activity resulted in rising operating costs and lower profits for owners, often already operating on slim margins. To maintain profits by keeping labour costs low, there was a growing reliance from the 1970s and 80s on the hiring of migrant labourers. They were willing to work for less and were easily exploited due to language barriers and a lack of legal rights, such as the ability to organise trade unions. Workers from neighbouring countries were soon being tricked and trafficked into Thailand to engage in exhausting fishing work, often receiving little or no money. Vessel operators would use intimidation, threats, verbal and physical abuse, and would even murder uncooperative crew-members in front of their peers to keep them in line. In the early 2010s, Thai vessels were found to be plundering waters across South East Asia using a sophisticated network of resupply vessels to replenish fishing vessels with food, water, and fuel. This would allow them to stay at sea for months or even years at a time whilst exploiting thousands of undocumented, trafficked workers unbeknownst to the authorities. Since the first reports and investigations of horrific human rights abuses on Thai fishing boats were revealed in 2015, the Thai Government has embarked on an ambitious programme of reforms across different sectors and government agencies. But to work, these need to be implemented comprehensively across the country, using a victim-based approach. To entrench recent reforms in the long term, Thailand also needs to sign and implement important treaties from the International Labour Organisation, such as conventions that set standards for conditions on vessels and give migrant workers the right to organise trade unions. EJF remains committed to working with the Thai government to ensure success. By working together we can secure our shared goal of a sustainable, legal, and ethical fishery. This would ensure that the marine environment and the human rights of those who work in and depend on it are protected now and in the future.